The swift completion of a fully functioning and interconnected internal energy market is crucial to maintaining security of energy supply, increasing competitiveness and ensuring that all consumers can purchase energy at affordable prices. Regulation (EC) No 714/2009 sets out non-discriminatory rules governing access to the network for cross-border exchanges in electricity with a view to ensuring the proper functioning of the internal market in electricity. In addition Article 5 of Directive 2009/72/EC of the European Parliament and of the Council (2) requires that Member States or, where Member States have so provided, regulatory authorities ensure, inter alia, that objective and non-discriminatory technical rules are developed which establish minimum technical design and operational requirements for the connection to the system. Where requirements constitute terms and conditions for connection to national networks, Article 37(6) of the same Directive requires regulatory authorities to be responsible for fixing or approving at least the methodologies used to calculate or establish them. In order to provide system security within the interconnected transmission system, it is essential to establish a common understanding of the requirements for High-Voltage Direct Current (HVDC) systems and direct current-connected power park modules (DC-connected power park modules). Those requirements that contribute to maintaining, preserving and restoring system security in order to facilitate proper functioning of the internal electricity market within and between synchronous areas, and to achieve cost efficiencies, should be regarded as cross-border network issues and market integration issues. Harmonised rules for grid connection for HVDC systems and DC-connected power park modules should be set out in order to provide a clear legal framework for grid connections, facilitate Union-wide trade in electricity, ensure system security, facilitate the integration of renewable electricity sources, increase competition and allow more efficient use of the network and resources, for the benefit of consumers. System security depends partly on the technical capabilities of HVDC systems and DC-connected power park modules. Therefore regular coordination at the level of the transmission and distribution networks and adequate performance of the equipment connected to the transmission and distribution networks with sufficient robustness to cope with disturbances and to help to prevent any major disruption or to facilitate restoration of the system after a collapse are fundamental prerequisites. Secure system operation is only possible if there is close cooperation between owners of HVDC systems and DC-connected power park modules and system operators. In particular, the functioning of the system under abnormal operating conditions depends on the response of the HVDC systems and DC-connected power park modules to deviations from the reference 1 per unit (pu) values of voltage and nominal frequency. In the context of system security, the networks and the HVDC systems and DC-connected power park modules should be considered as one entity from a system engineering point of view, given that those parts are interdependent. Therefore, as a prerequisite for grid connection, relevant technical requirements should be set for HVDC systems and DC-connected power park modules. Regulatory authorities should consider the reasonable costs effectively incurred by system operators in the implementation of this Regulation when fixing or approving transmission or distribution tariffs or their methodologies or when approving the terms and conditions for connection and access to national networks in accordance with Article 37(1) and (6) of Directive 2009/72/EC and with Article 14 of Regulation (EC) No 714/2009. Different synchronous electricity systems in the Union have different characteristics which need to be taken into account when setting the requirements for HVDC systems and DC-connected power park modules. It is therefore appropriate to consider regional specificities when establishing network connection rules as required by Article 8(6) of Regulation (EC) No 714/2009. In view of the need to provide regulatory certainty, the requirements of this Regulation should apply to new HVDC systems and new DC-connected power park modules but should not apply to HVDC systems and DC-connected power park modules already existing or at an advanced stage of planning but not yet completed unless the relevant regulatory authority or Member State decides otherwise based on evolution of system requirements and a full cost-benefit analysis, or where there has been substantial modernisation of those facilities. Due to its cross-border impact, this Regulation should aim at the same frequency-related requirements for all voltage levels, at least within a synchronous area. That is necessary because, within a synchronous area, a change in frequency in one Member State would immediately impact frequency and could damage equipment in all other Member States. To ensure system security, it should be possible for HVDC systems and DC-connected power park modules in each synchronous area of the interconnected system to remain connected to the system for specified frequency and voltage ranges. Voltage ranges should be coordinated between interconnected systems because they are crucial to secure planning and operation of a power system within a synchronous area. Disconnections because of voltage disturbances have an impact on neighbouring systems. Failure to specify voltage ranges could lead to widespread uncertainty in planning and operation of the system with respect to operation beyond normal operating conditions. Appropriate and proportionate compliance testing should be introduced so that system operators can ensure operational security. In accordance with Article 37(1)(b) of Directive 2009/72/EC, regulatory authorities are responsible for ensuring that system operators are compliant with this Regulation. The regulatory authorities, Member States and system operators should ensure that, in the process of developing and approving the requirements for network connection, they are harmonised to the extent possible, in order to ensure full market integration. Established technical standards should be taken into particular consideration in the development of connection requirements. A process for derogating from the rules should be set out in this Regulation to take into account local circumstances where exceptionally, for example, compliance with those rules could jeopardise the stability of the local network or where the safe operation of an HVDC system or DC-connected power park module might require operating conditions that are not in line with this Regulation. In the case of DC-connected power park modules, new modules could, in the future form part of a meshed off-shore grid connecting to more than one synchronous area. In this case, certain technical requirements should be set in order to maintain system security and ensure that future meshed networks can be developed cost-effectively. However, for certain requirements, DC-connected power park modules should only be required to fit the equipment needed for system security at the time it becomes necessary. Therefore, the owners of DC-connected power park modules which are, or will be, connected to one synchronous area with a radial connection should have the possibility to apply, via an expedited process, for derogations to requirements that will only be needed where the power park modules become connected to a meshed grid and which take account of case-by-case circumstances. They should also be informed as early as possible whether they qualify for a derogation for the purposes of their investment decision-making. Subject to approval by the relevant regulatory authority, or other authority where applicable in a Member State, system operators should be allowed to propose derogations for certain classes of HVDC systems and DC-connected power park modules. This Regulation has been adopted on the basis of Regulation (EC) No 714/2009 which it supplements and of which it forms an integral part. References to Regulation (EC) No 714/2009 in other legal acts should be understood as also referring to this Regulation. This Regulation establishes a network code which lays down the requirements for grid connections of high-voltage direct current (HVDC) systems and DC-connected power park modules. It, therefore, helps to ensure fair conditions of competition in the internal electricity market, to ensure system security and the integration of renewable electricity sources, and to facilitate Union-wide trade in electricity. This regulation also lays down the obligations for ensuring that system operators make appropriate use of HVDC systems and DC-connected power park modules capabilities in a transparent and non-discriminatory manner to provide a level playing field throughout the Union. ‘HVDC converter unit’ means a unit comprising one or more converter bridges, together with one or more converter transformers, reactors, converter unit control equipment, essential protective and switching devices and auxiliaries, if any, used for the conversion. embedded HVDC systems within one control area and connected to the distribution network when a cross-border impact is demonstrated by the relevant transmission system operator (TSO). The relevant TSO shall consider the long-term development of the network in this assessment. 2. Relevant system operators, in coordination with relevant TSOs, shall propose to competent regulatory authorities the application of this Regulation for DC-connected power park modules with a single connection point to a transmission network or distribution network which is not part of a synchronous area for approval in accordance with Article 5. All other power park modules which are AC-collected but are DC-connected to a synchronous area are considered DC-connected power park modules and fall within the scope of this Regulation. the HVDC system is owned by an entity directly or indirectly controlled by an entity which also exercises control over the relevant TSO. 4. The connection requirements for HVDC systems provided for in Title II shall apply at the AC connection points of such systems, except the requirements provided for in Article 29(4) and (5) and Article 31(5), which can apply at other connection points, and Article 19(1) which may apply at the terminals of the HVDC converter station. 5. The connection requirements for DC-connected power park modules and remote-end HVDC converter stations provided for in Title III shall apply at the HVDC interface point of such systems, except the requirements provided for in Article 39(1)(a) and Article 47(2), which apply at the connection point in the synchronous area to which frequency response is being provided. 6. The relevant system operator shall refuse to allow the connection of a new HVDC system or DC-connected power park module which does not comply with the requirements set out in this Regulation and which is not covered by a derogation granted by the regulatory authority, or other authority where applicable in a Member State pursuant to Title VII. The relevant system operator shall communicate such refusal, by means of a reasoned statement in writing, to the HVDC system owner or DC-connected power park module owner and, unless specified otherwise by the regulatory authority, to the regulatory authority. HVDC systems or DC-connected power park modules connected to the transmission system and distribution systems or to parts of the transmission system, or distribution systems, of islands of Member States of which the systems are not operated synchronously with either the Continental Europe, Great Britain, Nordic, Ireland and Northern Ireland or Baltic synchronous area. a regulatory authority or, where applicable, a Member State decides to make an existing HVDC system or existing DC-connected power park module subject to all or some of the requirements of this Regulation, following a proposal from the relevant TSO in accordance with paragraphs 3, 4 and 5.
the HVDC system owner or DC-connected power park module owner has concluded a final and binding contract for the purchase of the main generating plant or HVDC equipment by two years after the entry into force of the Regulation. The HVDC system owner or DC-connected power park module owner must notify the relevant system operator and relevant TSO of conclusion of the contract within 30 months after the entry into force of the Regulation. The notification submitted by the HVDC system owner or DC-connected power park module owner to the relevant system operator and to the relevant TSO shall at least indicate the contract title, its date of signature and date of entry into force and the specifications of the main generating plant or HVDC equipment to be constructed, assembled or purchased. A Member State may provide that in specified circumstances the regulatory authority may determine whether the HVDC system or DC-connected power park module is to be considered an existing or new HVDC system or DC-connected power park module. 3. Following a public consultation in accordance to Article 8 and in order to address significant factual changes in circumstances, such as the evolution of system requirements including penetration of renewable energy sources, smart grids, distributed generation or demand response, the relevant TSO may propose to the regulatory authority concerned, or where applicable, to the Member State to extend the application of this Regulation to existing HVDC systems and/or DC-connected power park modules. the potential of alternative measures to achieve the required performance. obtain approval from the relevant regulatory authority or, where applicable, the Member State. 5. The relevant regulatory authority or, where applicable, the Member State shall decide on the extension of the applicability of this Regulation to existing HVDC systems or DC-connected power park modules within six months of receipt of the report and the recommendation of the relevant TSO in accordance with paragraph 4 of Article 65. The decision of the regulatory authority or, where applicable, the Member State shall be published. 6. The relevant TSO shall take account of the legitimate expectations of HVDC system owners and DC-connected power park modules owners as part of the assessment of the application of this Regulation to existing HVDC systems or DC-connected power park modules. 7. The relevant TSO may assess the application of some or all of the provisions of this Regulation to existing HVDC systems or DC-connected power park modules every three years in accordance with the criteria and process set out in paragraphs 3 to 5. 1. Requirements of general application to be established by relevant system operators or TSOs under this Regulation shall be subject to approval by the entity designated by the Member State and be published. The designated entity shall be the regulatory authority unless otherwise provided by the Member State. 2. For site specific requirements to be established by relevant system operators or TSOs under this Regulation, Member States may require approval by a designated entity. take into consideration agreed European standards and technical specifications. 4. The relevant system operator or TSO shall submit a proposal for requirements of general application, or the methodology used to calculate or establish them, for approval by the competent entity within two years of entry into force of this Regulation. 5. Where this Regulation requires the relevant system operator, relevant TSO, HVDC system owner, DC-connected power park module owner and/or the distribution system operator to seek agreement, they shall endeavour to do so within six months after a first proposal has been submitted by one party to the other parties. If no agreement has been found within this timeframe, each party may request the relevant regulatory authority to issue a decision within six months. 6. Competent entities shall take decisions on proposals for requirements or methodologies within six months following the receipt of such proposals. 7. If the relevant system operator or TSO deems an amendment to requirements or methodologies as provided for and approved under paragraph 1 and 2 to be necessary, the requirements provided for in paragraphs 3 to 8 shall apply to the proposed amendment. System operators and TSOs proposing an amendment shall take into account the legitimate expectations, if any, of HVDC system owners, DC-connected power park module owners, equipment manufacturers and other stakeholders based on the initially specified or agreed requirements or methodologies. 8. Any party having a complaint against a relevant system operator or TSO in relation to that relevant system operator's or TSO's obligations under this Regulation may refer the complaint to the regulatory authority which, acting as dispute settlement authority, shall issue a decision within two months after receipt of the complaint. That period may be extended by two months where additional information is sought by the regulatory authority. That extended period may be further extended with the agreement of the complainant. The regulatory authority's decision shall have binding effect unless and until overruled on appeal. 9. Where the requirements under this Regulation are to be established by a relevant system operator that is not a TSO, Member States may provide that instead the TSO be responsible for establishing the relevant requirements. 1. Where more than one TSO exists in a Member State, this Regulation shall apply to all those TSOs. 2. Member States may, under the national regulatory regime, provide that the responsibility of a TSO to comply with one or some or all obligations under this Regulation is assigned to one or more specific TSOs. 1. The costs borne by system operators subject to network tariff regulation and stemming from the obligations laid down in this Regulation shall be assessed by the relevant regulatory authorities. Costs assessed as reasonable, efficient and proportionate shall be recovered through network tariffs or other appropriate mechanisms. 2. If requested by the relevant regulatory authorities, system operators referred to in paragraph 1 shall, within three months of the request, provide the information necessary to facilitate assessment of the costs incurred. 1. Relevant system operators and relevant TSOs shall carry out consultation with stakeholders, including the competent authorities of each Member State, on proposals to extend the applicability of this Regulation to existing HVDC systems and DC-connected power park modules, in accordance with Article 4(3), on the report prepared in accordance with Article 65(3), and the cost-benefit analysis undertaken in accordance with Article 80(2). The consultation shall last at least for a period of one month. 2. The relevant system operators or relevant TSOs shall duly take into account the views of the stakeholders resulting from the consultations prior to the submission of the draft proposal or the report or cost benefit analysis for approval by the regulatory authority or, if applicable, the Member State. In all cases, a sound justification for including or not the views of the stakeholders shall be provided and published in a timely manner before, or simultaneously with, the publication of the proposal. The Agency for the Cooperation of Energy Regulators (the Agency), in close cooperation with the European Network of Transmission System Operators for Electricity (ENTSO for Electricity), shall organise stakeholder involvement regarding the requirements for grid connection of HVDC systems and DC-connected power park modules, and other aspects of the implementation of this Regulation. This shall include regular meetings with stakeholders to identify problems and propose improvements notably related to the requirements for grid connection of HVDC systems and DC-connected power park modules. 2. The obligation of professional secrecy shall apply to any persons, regulatory authorities or entities subject to the provisions of this Regulation. 3. Confidential information received by the persons, regulatory authorities or entities referred to in paragraph 2 in the course of their duties may not be divulged to any other person or authority, without prejudice to cases covered by national law, the other provisions of this Regulation or other relevant Union law. 4. Without prejudice to cases covered by national or Union law, regulatory authorities, entities or persons who receive confidential information pursuant to this Regulation may use it only for the purpose of carrying out their duties under this Regulation. 1. An HVDC system shall be capable of staying connected to the network and remaining operable within the frequency ranges and time periods specified in Table 1, Annex I for the short circuit power range as specified in Article 32(2). 2. The relevant TSO and HVDC system owner may agree on wider frequency ranges or longer minimum times for operation if needed to preserve or to restore system security. If wider frequency ranges or longer minimum times for operation are economically and technically feasible, the HVDC system owner shall not unreasonably withhold consent. 3. Without prejudice to paragraph 1, an HVDC system shall be capable of automatic disconnection at frequencies specified by the relevant TSO. 4. The relevant TSO may specify a maximum admissible active power output reduction from its operating point if the system frequency falls below 49 Hz. An HVDC system shall be capable of staying connected to the network and operable if the network frequency changes at a rate between – 2,5 and + 2,5 Hz/s (measured at any point in time as an average of the rate of change of frequency for the previous 1 s). an HVDC system shall be capable of adjusting the transmitted active power up to its maximum HVDC active power transmission capacity in each direction following an instruction from the relevant TSO. shall specify the maximum delay within which the HVDC system shall be capable of adjusting the transmitted active power upon receipt of request from the relevant TSO. the relevant TSO shall specify how an HVDC system shall be capable of modifying the transmitted active power infeed in case of disturbances into one or more of the AC networks to which it is connected. If the initial delay prior to the start of the change is greater than 10 milliseconds from receiving the triggering signal sent by the relevant TSO, it shall be reasonably justified by the HVDC system owner to the relevant TSO. the relevant TSO may specify that an HVDC system be capable of fast active power reversal. The power reversal shall be possible from the maximum active power transmission capacity in one direction to the maximum active power transmission capacity in the other direction as fast as technically feasible and reasonably justified by the HVDC system owner to the relevant TSOs if greater than 2 seconds. for HVDC systems linking various control areas or synchronous areas, the HVDC system shall be equipped with control functions enabling the relevant TSOs to modify the transmitted active power for the purpose of cross-border balancing. 2. An HVDC system shall be capable of adjusting the ramping rate of active power variations within its technical capabilities in accordance with instructions sent by relevant TSOs. In case of modification of active power according to points (b) and (c) of paragraph 1, there shall be no adjustment of ramping rate. 3. If specified by a relevant TSO, in coordination with adjacent TSOs, the control functions of an HVDC system shall be capable of taking automatic remedial actions including, but not limited to, stopping the ramping and blocking FSM, LFSM-O, LFSM-U and frequency control. The triggering and blocking criteria shall be specified by relevant TSO and subject to notification to the regulatory authority. The modalities of that notification shall be determined in accordance with the applicable national regulatory framework. 1. If specified by a relevant TSO, an HVDC system shall be capable of providing synthetic inertia in response to frequency changes, activated in low and/or high frequency regimes by rapidly adjusting the active power injected to or withdrawn from the AC network in order to limit the rate of change of frequency. The requirement shall at least take account of the results of the studies undertaken by TSOs to identify if there is a need to set out minimum inertia. 2. The principle of this control system and the associated performance parameters shall be agreed between the relevant TSO and the HVDC system owner. Requirements applying to frequency sensitive mode, limited frequency sensitive mode overfrequency and limited frequency sensitive mode underfrequency shall be as set out in Annex II. 1. If specified by the relevant TSO, an HVDC system shall be equipped with an independent control mode to modulate the active power output of the HVDC converter station depending on the frequencies at all connection points of the HVDC system in order to maintain stable system frequencies. 2. The relevant TSO shall specify the operating principle, the associated performance parameters and the activation criteria of the frequency control referred to in paragraph 1. 1. An HVDC system shall be configured in such a way that its loss of active power injection in a synchronous area shall be limited to a value specified by the relevant TSOs for their respective load frequency control area, based on the HVDC system's impact on the power system. 2. Where an HVDC system connects two or more control areas, the relevant TSOs shall consult each other in order to set a coordinated value of the maximum loss of active power injection as referred to in paragraph 1, taking into account common mode failures. 1. Without prejudice to Article 25, an HVDC converter station shall be capable of staying connected to the network and capable of operating at HVDC system maximum current, within the ranges of the network voltage at the connection point, expressed by the voltage at the connection point related to reference 1 pu voltage, and the time periods specified in Tables 4 and 5, Annex III. The establishment of the reference 1 pu voltage shall be subject to coordination between the adjacent relevant system operators. 2. The HVDC system owner and the relevant system operator, in coordination with the relevant TSO, may agree on wider voltage ranges or longer minimum times for operation than those specified in paragraph 1 in order to ensure the best use of the technical capabilities of an HVDC system if needed to preserve or to restore system security. If wider voltage ranges or longer minimum times for operation are economically and technically feasible, the HVDC system owner shall not unreasonably withhold consent. 3. An HVDC converter station shall be capable of automatic disconnection at connection point voltages specified by the relevant system operator, in coordination with the relevant TSO. The terms and settings for automatic disconnection shall be agreed between the relevant system operator, in coordination with the relevant TSO, and the HVDC system owner. 4. For connection points at reference 1 pu AC voltages not included in the scope set out in Annex III, the relevant system operator, in coordination with relevant TSOs, shall specify applicable requirements at the connection points. 5. Notwithstanding the provisions of paragraph 1, the relevant TSOs in the Baltic synchronous area may, following consultation with relevant neighbouring TSOs, require HVDC converter stations to remain connected to the 400 kV network in the voltage ranges and for time periods that apply in the Continental Europe synchronous area. 1. If specified by the relevant system operator, in coordination with the relevant TSO, an HVDC system shall have the capability to provide fast fault current at a connection point in case of symmetrical (3-phase) faults. the timing and accuracy of the fast fault current, which may include several stages. 3. The relevant system operator, in coordination the relevant TSO, may specify a requirement for asymmetrical current injection in the case of asymmetrical (1-phase or 2-phase) faults. 1. The relevant system operator, in coordination with the relevant TSO, shall specify the reactive power capability requirements at the connection points, in the context of varying voltage. The proposal for those requirements shall include a U-Q/Pmax-profile, within the boundary of which the HVDC converter station shall be capable of providing reactive power at its maximum HVDC active power transmission capacity. the position of the U-Q/Pmax-profile envelope shall lie within the limits of the fixed outer envelope in the figure set out in Annex IV. 3. An HVDC system shall be capable of moving to any operating point within its U-Q/Pmax profile in timescales specified by the relevant system operator in coordination with the relevant TSO. 4. When operating at an active power output below the maximum HVDC active power transmission capacity (P < Pmax), the HVDC converter station shall be capable of operating in every possible operating point, as specified by the relevant system operator in coordination with the relevant TSO and in accordance with the reactive power capability set out by the U-Q/Pmax profile specified in paragraphs 1 to 3. 1. The HVDC system owner shall ensure that the reactive power of its HVDC converter station exchanged with the network at the connection point is limited to values specified by the relevant system operator in coordination with the relevant TSO. 2. The reactive power variation caused by the reactive power control mode operation of the HVDC converter Station, referred to in Article 22(1), shall not result in a voltage step exceeding the allowed value at the connection point. The relevant system operator, in coordination with the relevant TSO, shall specify this maximum tolerable voltage step value. 2. An HVDC converter station shall be capable of operating in additional control modes specified by the relevant system operator in coordination with the relevant TSO. settling at the value specified by the operating slope within a time t2 specified by the relevant system operator in coordination with the relevant TSO. The time t2 shall be in the range of 1-60 seconds, with a specified steady-state tolerance given in % of the maximum reactive power. voltage control mode shall include the capability to change reactive power output based on a combination of a modified setpoint voltage and an additional instructed reactive power component. The slope shall be specified by a range and step specified by the relevant system operator in coordination with the relevant TSO. 4. With regard to reactive power control mode, the relevant system operator shall specify a reactive power range in MVAr or in % of maximum reactive power, as well as its associated accuracy at the connection point, using the capabilities of the HVDC system, while respecting Articles 20 and 21. 5. For the purposes of power factor control mode, the HVDC converter station shall be capable of controlling the power factor to a target at the connection point, while respecting Articles 20 and 21. The available setpoints shall be available in steps no greater than a maximum allowed step specified by the relevant system operator. 6. The relevant system operator in coordination with the relevant TSO shall specify any equipment needed to enable the remote selection of control modes and relevant setpoints. Taking into account the capabilities of the HVDC system specified in accordance with this Regulation, the relevant TSO shall determine whether active power contribution or reactive power contribution shall have priority during low or high voltage operation and during faults for which fault-ride-through capability is required. If priority is given to active power contribution, its provision shall be established within a time from the fault inception as specified by relevant TSO. An HVDC system owner shall ensure that its HVDC system connection to the network does not result in a level of distortion or fluctuation of the supply voltage on the network, at the connection point, exceeding the level specified by the relevant system operator in coordination with the relevant TSO. The process for necessary studies to be conducted and relevant data to be provided by all grid users involved, as well as mitigating actions identified and implemented, shall be in accordance with the process in Article 29. 1. The relevant TSO shall specify, while respecting Article 18, a voltage-against time profile as set out in Annex V and having regard to the voltage-against-time-profile specified for power park modules according to Regulation (EU) 2016/631. This profile shall apply at connection points for fault conditions, under which the HVDC converter station shall be capable of staying connected to the network and continuing stable operation after the power system has recovered following fault clearance. The voltage-against-time-profile shall express a lower limit of the actual course of the phase-to-phase voltages on the network voltage level at the connection point during a symmetrical fault, as a function of time before, during and after the fault. Any ride through period beyond trec2 shall be specified by the relevant TSO consistent with Article 18.
post-fault minimum short circuit capacity at each connection point expressed in MVA. Alternatively, generic values for the above conditions derived from typical cases may be provided by the relevant system operator. 3. The HVDC converter station shall be capable of staying connected to the network and continue stable operation when the actual course of the phase-to-phase voltages on the network voltage level at the connection point during a symmetrical fault, given the pre-fault and post-fault conditions provided for in Article 32, remain above the lower limit set out in the figure in Annex V, unless the protection scheme for internal faults requires the disconnection of the HVDC converter station from the network. The protection schemes and settings for internal faults shall be designed not to jeopardise fault-ride-through performance. 4. The relevant TSO may specify voltages (Ublock) at the connection points under specific network conditions whereby the HVDC system is allowed to block. Blocking means remaining connected to the network with no active and reactive power contribution for a time frame that shall be as short as technically feasible and which shall be agreed between the relevant TSOs and the HVDC system owner. 5. In accordance Article 34, undervoltage protection shall be set by the HVDC system owner to the widest possible technical capability of the HVDC converter station. The relevant system operator, in coordination with the relevant TSO, may specify narrower settings pursuant to Article 34. 6. The relevant TSO shall specify fault-ride-through capabilities in case of asymmetrical faults. The relevant TSO shall specify the magnitude and time profile of active power recovery that the HVDC system shall be capable of providing, in accordance with Article 25. HVDC systems, including DC overhead lines, shall be capable of fast recovery from transient faults within the HVDC system. Details of this capability shall be subject to coordination and agreements on protection schemes and settings pursuant to Article 34. Unless otherwise instructed by the relevant system operator, during the energisation or synchronisation of an HVDC converter station to the AC network or during the connection of an energised HVDC converter station to an HVDC system, the HVDC converter station shall have the capability to limit any voltage changes to a steady-state level specified by the relevant system operator in coordination with the relevant TSO. The level specified shall not exceed 5 per cent of the pre-synchronisation voltage. The relevant system operator, in coordination with the relevant TSO, shall specify the maximum magnitude, duration and measurement window of the voltage transients. 1. When several HVDC converter stations or other plants and equipment are within close electrical proximity, the relevant TSO may specify that a study is required, and the scope and extent of that study, to demonstrate that no adverse interaction will occur. If adverse interaction is identified, the studies shall identify possible mitigating actions to be implemented to ensure compliance with the requirements of this Regulation. 2. The studies shall be carried out by the connecting HVDC system owner with the participation of all other parties identified by the TSOs as relevant to each connection point. Member States may provide that the responsibility for undertaking the studies in accordance with this Article lies with the TSO. All parties shall be informed of the results of the studies. 3. All parties identified by the relevant TSO as relevant to each connection point, including the relevant TSO, shall contribute to the studies and shall provide all relevant data and models as reasonably required to meet the purposes of the studies. The relevant TSO shall collect this input and, where applicable, pass it on to the party responsible for the studies in accordance with Article 10. 4. The relevant TSO shall assess the result of the studies based on their scope and extent as specified in accordance with paragraph 1. If necessary for the assessment, the relevant TSO may request the HVDC system owner to perform further studies in line with the scope and extent specified in accordance with paragraph 1. 5. The relevant TSO may review or replicate some or all of the studies. The HVDC system owner shall provide the relevant TSO all relevant data and models that allow such study to be performed. 6. Any necessary mitigating actions identified by the studies carried out in accordance with paragraphs 2 to 5 and reviewed by the relevant TSO shall be undertaken by the HVDC system owner as part of the connection of the new HVDC converter station. 7. The relevant TSO may specify transient levels of performance associated with events for the individual HVDC system or collectively across commonly impacted HVDC systems. This specification may be provided to protect the integrity of both TSO equipment and that of grid users in a manner consistent with its national code. The HVDC system shall be capable of contributing to the damping of power oscillations in connected AC networks. The control system of the HVDC system shall not reduce the damping of power oscillations. The relevant TSO shall specify a frequency range of oscillations that the control scheme shall positively damp and the network conditions when this occurs, at least accounting for any dynamic stability assessment studies undertaken by TSOs to identify the stability limits and potential stability problems in their transmission systems. The selection of the control parameter settings shall be agreed between the relevant TSO and the HVDC system owner. 1. With regard to subsynchronous torsional interaction (SSTI) damping control, the HVDC system shall be capable of contributing to electrical damping of torsional frequencies. 2. The relevant TSO shall specify the necessary extent of SSTI studies and provide input parameters, to the extent available, related to the equipment and relevant system conditions in its network. The SSTI studies shall be provided by the HVDC system owner. The studies shall identify the conditions, if any, where SSTI exists and propose any necessary mitigation procedure. Member States may provide that the responsibility for undertaking the studies in accordance with this Article lies with the TSO. All parties shall be informed of the results of the studies. 4. The relevant TSO shall assess the result of the SSTI studies. If necessary for the assessment, the relevant TSO may request that the HVDC system owner perform further SSTI studies in line with this same scope and extent. 5. The relevant TSO may review or replicate the study. The HVDC system owner shall provide the relevant TSO all relevant data and models that allow such study to be performed. 6. Any necessary mitigating actions identified by the studies carried out in accordance with paragraphs 2 or 4, and reviewed by the relevant TSOs, shall be undertaken by the HVDC system owner as part of the connection of the new HVDC converter station. 1. The relevant system operator shall specify and make publicly available the method and the pre-fault and post-fault conditions for the calculation of at least the minimum and maximum short circuit power at the connection points. 2. The HVDC system shall be capable of operating within the range of short circuit power and network characteristics specified by the relevant system operator. 3. Each relevant system operator shall provide the HVDC system owner with network equivalents describing the behaviour of the network at the connection point, enabling the HVDC system owners to design their system with regard to at least, but not limited to, harmonics and dynamic stability over the lifetime of the HVDC system. 1. The HVDC system shall be capable of finding stable operation points with a minimum change in active power flow and voltage level, during and after any planned or unplanned change in the HVDC system or AC network to which it is connected. The relevant TSO shall specify the changes in the system conditions for which the HVDC systems shall remain in stable operation. 2. The HVDC system owner shall ensure that the tripping or disconnection of an HVDC converter station, as part of any multi-terminal or embedded HVDC system, does not result in transients at the connection point beyond the limit specified by the relevant TSO. 3. The HVDC system shall withstand transient faults on HVAC lines in the network adjacent or close to the HVDC system, and shall not cause any of the equipment in the HVDC system to disconnect from the network due to auto-reclosure of lines in the network. 4. The HVDC system owner shall provide information to the relevant system operator on the resilience of the HVDC system to AC system disturbances. 1. The relevant system operator shall specify, in coordination with the relevant TSO, the schemes and settings necessary to protect the network taking into account the characteristics of the HVDC system. Protection schemes relevant for the HVDC system and the network, and settings relevant for the HVDC system, shall be coordinated and agreed between the relevant system operator, the relevant TSO and the HVDC system owner. The protection schemes and settings for internal electrical faults shall be designed so as not to jeopardise the performance of the HVDC system in accordance with this Regulation. 2. Electrical protection of the HVDC system shall take precedence over operational controls taking into account system security, health and safety of staff and the public and mitigation of the damage to the HVDC system. 3. Any change to the protection schemes or their settings relevant to the HVDC system and the network shall be agreed between the relevant system operator, the relevant TSO and the HVDC system owner before being implemented by the HVDC system owner. 1. A control scheme, specified by the HVDC system owner consisting of different control modes, including the settings of the specific parameters, shall be coordinated and agreed between the relevant TSO, the relevant system operator and the HVDC system owner. 1. The parameters of the different control modes and the protection settings of the HVDC system shall be able to be changed in the HVDC converter station, if required by the relevant system operator or the relevant TSO, and in accordance with paragraph 3. 2. Any change to the schemes or settings of parameters of the different control modes and protection of the HVDC system, including the procedure, shall be coordinated and agreed between the relevant system operator, the relevant TSO and the HVDC system owner. 3. The control modes and associated setpoints of the HVDC system shall be capable of being changed remotely, as specified by the relevant system operator, in coordination with the relevant TSO. 1. The relevant TSO may obtain a quote for black start capability from an HVDC system owner. 2. An HVDC system with black start capability shall be able, in case one converter station is energised, to energise the busbar of the AC-substation to which another converter station is connected, within a timeframe after shut down of the HVDC system determined by the relevant TSOs. The HVDC system shall be able to synchronise within the frequency limits set out in Article 11 and within the voltage limits specified by the relevant TSO or as provided for in Article 18, where applicable. Wider frequency and voltage ranges can be specified by the relevant TSO where needed in order to restore system security. 3. The relevant TSO and the HVDC system owner shall agree on the capacity and availability of the black start capability and the operational procedure. The requirements applicable to offshore power park modules under Articles 13 to 22 of Regulation (EU) 2016/631 shall apply to DC-connected power park modules subject to specific requirements provided for in Articles 41 to 45 of this Regulation. These requirements shall apply at the HVDC interface points of the DC-connected power park module and the HVDC systems. The categorisation in Article 5 of Regulation (EU) 2016/631 shall apply to DC-connected power park modules. DC-connected power park modules connected via HVDC systems which connect with more than one control area shall be capable of delivering coordinated frequency control as specified by the relevant TSO. while respecting the provisions of point (a) of paragraph 2, a DC-connected power park module shall be capable of automatic disconnection at specified frequencies, if specified by the relevant TSO. Terms and settings for automatic disconnection shall be agreed between the relevant TSO and the DC-connected power park module owner. 3. With regards to rate-of-change-of-frequency withstand capability, a DC-connected power park module shall be capable of staying connected to the remote-end HVDC converter station network and operable if the system frequency changes at a rate up to +/– 2 Hz/s (measured at any point in time as an average of the rate of change of frequency for the previous 1 second) at the HVDC interface point of the DC-connected power park module at the remote end HVDC converter station for the 50 Hz nominal system. 4. DC-connected power park modules shall have limited frequency sensitive mode — overfrequency (LFSM-O) capability in accordance with Article 13(2) of Regulation (EU) 2016/631, subject to fast signal response as specified in paragraph 1 for the 50 Hz nominal system. 5. A capability for DC-connected power park modules to maintain constant power shall be determined in accordance with Article 13(3) of Regulation (EU) 2016/631 for the 50 Hz nominal system. 6. A capability for active power controllability of DC-connected power park modules shall be determined in accordance with Article 15(2)(a) of Regulation (EU) 2016/631 for the 50 Hz nominal system. Manual control shall be possible in the case that remote automatic control devices are out of service. 7. A capability for limited frequency sensitive mode — underfrequency (LFSM-U) for a DC-connected power park module shall be determined in accordance with Article 15(2)(c) of Regulation (EU) 2016/631, subject to fast signal response as specified in paragraph 1 for the 50 Hz nominal system. 8. A capability for frequency sensitive mode for a DC-connected power park module shall be determined in accordance with Article 15(2)(d) of Regulation (EU) 2016/631, subject to a fast signal response as specified in paragraph 1 for the 50 Hz nominal system. 9. A capability for frequency restoration for a DC-connected power park module shall be determined in accordance with Article 15(2)(e) of Regulation (EU) 2016/631 for the 50 Hz nominal system. 10. Where a constant nominal frequency other than 50 Hz, a frequency variable by design or a DC system voltage is used, subject to the agreement of the relevant TSO, the capabilities listed in paragraphs 3 to 9 and the parameters associated with such capabilities shall be specified by the relevant TSO. where frequencies other than nominal 50 Hz are used, subject to relevant TSO agreement, the voltage ranges and time periods specified by the relevant system operator, in coordination with the relevant TSO, shall be proportional to those in Tables 9 and 10, Annex VII. demonstrate to, and then reach agreement with, the relevant system operator and the relevant TSO on how the reactive power capability will be provided when the DC-connected power park module is connected to more than a single connection point in the AC network, or the AC network at the remote-end HVDC converter station network has either another DC-connected power park module or HVDC system with a different owner connected to it. This agreement shall include a contract by the DC-connected power park module owner (or any subsequent owner), that it will finance and install reactive power capabilities required by this Article for its power park modules at a point in time specified by the relevant system operator, in coordination with the relevant TSO. The relevant system operator, in coordination with the relevant TSO shall inform the DC-connected power park module owner of the proposed completion date of any committed development which will require the DC-connected power park module owner to install the full reactive power capability. the relevant system operator, in coordination with the relevant TSO shall account for the development time schedule of retrofitting the reactive power capability to the DC-connected power park module in specifying the point in time by which this reactive power capability retrofitting is to take place. The development time schedule shall be provided by the DC-connected power park module owner at the time of connection to the AC network. with regard to reactive power capability at maximum HVDC active power transmission capacity, DC-connected power park modules shall meet the reactive power provision capability requirements specified by the relevant system operator, in coordination with the relevant TSO, in the context of varying voltage. The relevant system operator shall specify a U-Q/Pmax-profile that may take any shape with ranges in accordance with Table 11, Annex VII, within which the DC-connected power park module shall be capable of providing reactive power at its maximum HVDC active power transmission capacity. The relevant system operator, in coordination with the relevant TSO, shall consider the long term development of the network when determining these ranges, as well as the potential costs for power park modules of delivering the capability of providing reactive power production at high voltages and reactive power consumption at low voltages. the DC-connected power park module owner shall demonstrate to, and then reach agreement with, the relevant system operator and the relevant TSO on how the reactive power capability prescribed in Article 25(4) of Regulation (EU) 2016/631 for that synchronous area will be provided in the event that the DC-connected power park module becomes AC-connected to the synchronous area. With regard to reactive power capability, the relevant system operator may specify supplementary reactive power to be provided if the connection point of a DC-connected power park module is neither located at the high-voltage terminals of the step-up transformer to the voltage level of the connection point nor at the alternator terminals, if no step-up transformer exists. This supplementary reactive power shall compensate the reactive power exchange of the high-voltage line or cable between the high-voltage terminals of the step-up transformer of the DC-connected power park module or its alternator terminals, if no step-up transformer exists, and the connection point and shall be provided by the responsible owner of that line or cable. 3. With regard to priority to active or reactive power contribution for DC-connected power park modules, the relevant system operator, in coordination with the relevant TSO shall specify whether active power contribution or reactive power contribution has priority during faults for which fault-ride-through capability is required. If priority is given to active power contribution, its provision shall be established within a time from the fault inception as specified by the relevant system operator, in coordination with the relevant TSO. 1. During the synchronisation of a DC-connected power park module to the AC collection network, the DC-connected power park module shall have the capability to limit any voltage changes to a steady-state level specified by the relevant system operator, in coordination with the relevant TSO. The level specified shall not exceed 5 per cent of the pre-synchronisation voltage. The relevant system operator, in coordination with the relevant TSO, shall specify the maximum magnitude, duration and measurement window of the voltage transients. 2. The DC-connected power park module owner shall provide output signals as specified by the relevant system operator, in coordination with the relevant TSO. 1. Electrical protection schemes and settings of DC-connected power park modules shall be determined in accordance with Article 14(5)(b) of Regulation (EU) 2016/631, where the network refers to the synchronous area network. The protection schemes have to be designed taking into account the system performance, grid specificities as well as technical specificities of the power park module technology and agreed with the relevant system operator, in coordination with the relevant TSO. 2. Priority ranking of protection and control of DC-connected power park modules shall be determined in accordance with Article 14(5)(c) of Regulation (EU) 2016/631, where the network refers to the synchronous area network, and agreed with the relevant system operator, in coordination with the relevant TSO. DC-connected power park modules owners shall ensure that their connection to the network does not result in a level of distortion or fluctuation of the supply voltage on the network, at the connection point, exceeding the level specified by the relevant system operator, in coordination with the relevant TSO. The necessary contribution from grid users to associated studies, including, but not limited to, existing DC-connected power park modules and existing HVDC systems, shall not be unreasonably withheld. The process for necessary studies to be conducted and relevant data to be provided by all grid users involved, as well as mitigating actions identified and implemented, shall be in accordance with the process in Article 29. With regard to general system management requirements, Articles 14(5), 15(6) and 16(4) of Regulation (EU) 2016/631 shall apply to any DC-connected power park module. The requirements of Articles 11 to 39 apply to remote-end HVDC converter stations, subject to specific requirements provided for in Articles 47 to 50. 1. Where a nominal frequency other than 50 Hz, or a frequency variable by design is used in the network connecting the DC-connected power park modules, subject to relevant TSO agreement, Article 11 shall apply to the remote-end HVDC converter station with the applicable frequency ranges and time periods specified by the relevant TSO, taking into account specificities of the system and the requirements laid down in Annex I. 2. With regards to frequency response, the remote-end HVDC converter station owner and the DC-connected power park module owner shall agree on the technical modalities of the fast signal communication in accordance with Article 39(1). Where the relevant TSO requires, the HVDC system shall be capable of providing the network frequency at the connection point as a signal. For an HVDC system connecting a power park module the adjustment of active power frequency response shall be limited by the capability of the DC-connected power park modules. where frequencies other than nominal 50 Hz are used, subject to agreement by the relevant TSO, the voltage ranges and time periods specified by the relevant system operator, in coordination with the relevant TSO, shall be proportional to those in Annex VIII. the U-Q/Pmax-profile shall be specified by each relevant system operator, in coordination with the relevant TSO. The U-Q/Pmax-profile shall be within the range of Q/Pmax and steady-state voltage specified in Table 14, Annex VIII, and the position of the U-Q/Pmax-profile envelope shall lie within the limits of the fixed outer envelope specified in Annex IV. The relevant system operator, in coordination with the relevant TSO, shall consider the long term development of the network when determining these ranges. With regard to the network characteristics, the remote-end HVDC converter station owner shall provide relevant data to any DC-connected power park module owner in accordance with Article 42. Remote-end HVDC converter station owners shall ensure that their connection to the network does not result in a level of distortion or fluctuation of the supply voltage on the network, at the connection point, exceeding the level allocated to them by the relevant system operator, in coordination with the relevant TSO. The necessary contribution from grid users to the associated studies shall not be unreasonably withheld, including from, but not limited to, existing DC-connected power park modules and existing HVDC systems. The process for necessary studies to be conducted and relevant data to be provided by all grid users involved, as well as mitigating actions identified and implemented shall be in accordance with the process provided for in Article 29. 1. With regard to instrumentation for the operation, each HVDC converter unit of an HVDC system shall be equipped with an automatic controller capable of receiving instructions from the relevant system operator and from the relevant TSO. This automatic controller shall be capable of operating the HVDC converter units of the HVDC system in a coordinated way. The relevant system operator shall specify the automatic controller hierarchy per HVDC converter unit. FSM, LFSM-O and LFSM-U active power ranges. fast active power reversal command. 4. With regards to each signal, the relevant system operator may specify the quality of the supplied signal. subsynchronous torsional interaction damping capability, referred to Article 31. 2. The relevant system operator may specify quality of supply parameters to be complied with by the HVDC system, provided a reasonable prior notice is given. 3. The particulars of the fault recording equipment referred to in paragraph 1, including analogue and digital channels, the settings, including triggering criteria and the sampling rates, shall be agreed between the HVDC system owner, the relevant system operator and the relevant TSO. 4. All dynamic system behaviour monitoring equipment shall include an oscillation trigger, specified by the relevant system operator, in coordination with the relevant TSO, with the purpose of detecting poorly damped power oscillations. 5. The facilities for quality of supply and dynamic system behaviour monitoring shall include arrangements for the HVDC system owner and the relevant system operator to access the information electronically. The communications protocols for recorded data shall be agreed between the HVDC system owner, the relevant system operator and the relevant TSO. 1. The relevant system operator in coordination with the relevant TSO may specify that an HVDC system owner deliver simulation models which properly reflect the behaviour of the HVDC system in both steady-state, dynamic simulations (fundamental frequency component) and in electromagnetic transient simulations. The format in which models shall be provided and the provision of documentation of models structure and block diagrams shall be specified by the relevant system operator in coordination with the relevant TSO. HVDC system protection models as agreed between the relevant TSO and the HVDC system owner. 3. The HVDC system owner shall verify the models against the results of compliance tests carried out according to Title VI and a report of this verification shall be submitted to the relevant TSO. The models shall then be used for the purpose of verifying compliance with the requirements of this Regulation including, but not limited to, compliance simulations as provided for in Title VI and used in studies for continuous evaluation in system planning and operation. 4. An HVDC system owner shall submit HVDC system recordings to the relevant system operator or relevant TSO if requested in order to compare the response of the models with these recordings. 5. An HVDC system owner shall deliver an equivalent model of the control system when adverse control interactions may result with HVDC converter stations and other connections in close electrical proximity if requested by the relevant system operator or relevant TSO. The equivalent model shall contain all necessary data for the realistic simulation of the adverse control interactions. 1. The HVDC system owner shall demonstrate to the relevant system operator that it has complied with the requirements set out in Title II to Title IV at the respective connection point by successfully completing the operational notification procedure for connection of the HVDC system as described in Articles 56 to 59. 2. The relevant system operator shall specify any detailed provisions of the operational notification procedure and make the details publicly available. 1. An EON shall entitle the HVDC system owner to energise its internal network and auxiliaries and connect it to the network at its specified connection points. 2. An EON shall be issued by the relevant system operator, subject to completion of preparation and the fulfilment of the requirements specified by the relevant system operator in the relevant operational procedures. This preparation will include agreement on the protection and control settings relevant to the connection points between the relevant system operator and the HVDC system owner. 1. An ION shall entitle a HVDC system owner or HVDC converter unit owner to operate the HVDC system or HVDC converter unit by using the network connections specified for the connection points for a limited period of time. 2. An ION shall be issued by the relevant system operator subject to the completion of the data and study review process. details of intended practical method of completing compliance tests pursuant to Title VI. 4. Except where paragraph 5 applies, the maximum period for the HVDC system owner or HVDC converter unit owner to remain in the ION status shall not exceed twenty four months. The relevant system operator may specify a shorter ION validity period. The ION validity period shall be notified to the regulatory authority in accordance with the applicable national regulatory framework. ION extension shall be granted only if the HVDC system owner demonstrates substantial progress towards full compliance. At the time of ION extension, the outstanding issues shall be explicitly identified. 5. The maximum period for an HVDC system owner or HVDC converter unit owner to remain in the ION status may be extended beyond 24 months upon request for a derogation made to the relevant system operator in accordance with the procedure in Title VII. The request shall be made before the expiry of the twenty four month period. 1. A FON shall entitle an HVDC system owner to operate the HVDC system or HVDC converter units by using the grid connection points. 2. A FON shall be issued by the relevant system operator upon prior removal of all incompatibilities identified for the purpose of the ION status and subject to the completion of the data and study review process. update of applicable technical data, simulation models, a replica of the exact control system and studies as referred to in Article 57, including use of actual measured values during testing. 4. In case of incompatibility identified for the purpose of the granting of the FON, a derogation may be granted upon a request to the relevant system operator, in accordance with Articles 79 and 80. A FON shall be issued by the relevant system operator, if the HVDC system is compliant with the provisions of the derogation. Where a request for a derogation is rejected, the relevant system operator shall have the right to refuse the operation of the HVDC system or HVDC converter units, whose owner's request for a derogation was rejected, until the HVDC system owner and the relevant system operator have resolved the incompatibility and the relevant system operator considers that the HVDC system complies with the provisions of this Regulation. If the relevant system operator and the HVDC system owner do not resolve the incompatibility within a reasonable timeframe, but in any case not later than six months after the notification of the rejection of the request for a derogation, each party may refer the issue for decision to the regulatory authority. in case of equipment failures leading to non-compliance with some relevant requirements. 2. The HVDC system owner shall apply to the relevant system operator for a limited operational notification (LON) if the HVDC system owner reasonably expects the circumstances detailed in paragraph 1 to persist for more than three months. a maximum period of validity which shall not exceed 12 months. The initial period granted may be shorter with the possibility for extension if evidence to the satisfaction of the relevant system operator demonstrates that substantial progress has been made towards achieving full compliance. 4. The FON shall be suspended during the period of validity of the LON with regard to the subjects for which the LON has been issued. 5. A further prolongation of the period of validity of the LON may be granted upon request for a derogation made to the relevant system operator before the expiry of that period, in accordance with Articles 79 and 80. 6. The relevant system operator may refuse the operation of the HVDC system if the LON terminates and the circumstance which caused it to be issued remains. In such a case the FON shall automatically be invalid. 7. If the relevant system operator does not grant an extension of the period of validity of the LON in accordance with paragraph 5 or if it refuses to allow the operation of the HVDC system once the LON is no longer valid in accordance with paragraph 6, the HVDC system owner may refer the issue for decision to the regulatory authority within six months after the notification of the decision of the relevant system operator. 1. The provisions of this Chapter shall apply to new DC-connected power park modules only. 2. The DC-connected power park module owner shall demonstrate to the relevant system operator its compliance with the requirements referred to in Title III at the respective connection points by successfully completing the operational notification procedure for connection of the DC-connected power park module in accordance with Articles 61 through to 66. 3. The relevant system operator shall specify further details of the operational notification procedure and make those details publically available. 1. An EON shall entitle the owner of a DC-connected power park module to energise its internal network and auxiliaries by using the grid connection that is specified by the connection points. 2. An EON shall be issued by the relevant system operator, subject to completion of preparation including agreement on the protection and control settings relevant to the connection points between the relevant system operator and the DC-connected power park module. 1. An ION shall entitle the DC-connected power park module owner to operate the DC-connected power park module and generate power by using the grid connection for a limited period of time. 2. An ION shall be issued by the relevant system operator, subject to the completion of the data and study review process. details of intended compliance tests in accordance with Article 73. 4. Except where paragraph 5 applies, the maximum period for the DC-connected power park module owner to remain in the ION status shall not exceed twenty-four months. The relevant system operator may specify shorter ION validity. The ION validity period shall be notified to the regulatory authority in accordance with the applicable national regulatory framework. ION extensions shall be granted only if the DC-connected power park module owner demonstrates substantial progress towards full compliance. At the time of ION extension, any outstanding issues shall be explicitly identified. 5. The maximum period for a DC-connected power park module owner to remain in the ION status may be extended beyond 24 months upon request for a derogation made to the relevant system operator in accordance with the procedure in Title VII. 1. A FON shall entitle the DC-connected power park module owner to operate the DC-connected power park module by using the grid connection that is specified by the connection point. 2. A FON shall be issued by the relevant system operator, upon prior removal of all incompatibilities identified for the purpose of the ION status and subject to the completion of the data and study review process as required by this Regulation. update of applicable technical data, simulation models and studies as referred to in Article 62(3), including use of actual measured values during testing. 4. In case of incompatibility identified for the purpose of the granting of the FON, a derogation may be granted upon request made to the relevant system operator, in accordance with the derogation procedure according to Title VII. A FON shall be issued by the relevant system operator, if the DC-connected power park module is compliant with the provisions of the derogation. The relevant system operator shall have the right to refuse the operation of the DC-connected power park module, whose owner's request for a derogation was rejected, until the DC-connected power park module owner and the relevant system operator have resolved the incompatibility and the DC-connected power park module is considered to be compliant by the relevant system operator. 2. The DC-connected power park module owner shall apply to the relevant system operator for a limited operational notification (LON), if the DC-connected power park module owner reasonably expects the circumstances detailed in paragraph 1 to persist for more than three months. a maximum period of validity which shall not exceed 12 months. The initial period granted may be shorter with the possibility for extension if evidence to the satisfaction of the relevant system operator demonstrating that substantial progress has been made towards achieving full compliance. 5. A further prolongation of the period of validity of the LON may be granted upon request for a derogation made to the relevant system operator, before the expiry of that period, in accordance with the derogation procedure described in Title VII. 6. The relevant system operator may refuse the operation of the DC-connected power park module if the LON terminates and the circumstance which caused it to be issued remains. In such a case the FON shall automatically be invalid. 1. Prior to the application of any requirement set out in this Regulation to existing HVDC systems or DC-connected power park modules in accordance with paragraph 3 of Article 4, the relevant TSO shall undertake a qualitative comparison of costs and benefits related to the requirement under consideration. This comparison shall take into account available network-based or market-based alternatives. The relevant TSO may only proceed to undertake a quantitative cost-benefit analysis in accordance with paragraphs 2 to 5, if the qualitative comparison indicates that the likely benefits exceed the likely costs. If, however, the cost is deemed high or the benefit is deemed low, then the relevant TSO shall not proceed further. 2. Following a preparatory stage undertaken in accordance with paragraph 1, the relevant TSO shall carry out a quantitative cost-benefit analysis of any requirement under consideration for application to existing HVDC systems or DC-connected power park modules that have demonstrated potential benefits as a result of the preparatory stage according to paragraph 1.
be subject to public consultation in accordance with Article 8. 4. No later than six months after the end of the public consultation, the relevant TSO shall prepare a report explaining the outcome of the consultation and making a proposal on the applicability of the requirement under consideration to existing HVDC systems or DC-connected power park modules. The report and proposal shall be notified to the regulatory authority or, where applicable, the Member State, and the HVDC system owner, DC-connected power park module owner or, where applicable, third party shall be informed on its content. a transitional period for implementing the requirements which shall take into account the category of HVDC system or DC-connected power park module and any underlying obstacles to the efficient implementation of the equipment modification/refitting. 1. HVDC system owners, DC-connected power park module owners and DSOs, including CDSOs, shall assist and contribute to the cost-benefit analysis undertaken according to Article 65 and 80 and provide the necessary data as requested by the relevant system operator or relevant TSO within three months of receiving a request, unless agreed otherwise by the relevant TSO. For the preparation of a cost-benefit-analysis by a HVDC system owner or DC-connected power park module owner, or their prospective owner, assessing a potential derogation pursuant to Article 79, the relevant TSO and DSO, including CDSO, shall assist and contribute to the cost-benefit analysis and provide the necessary data as requested by the HVDC system owner or DC-connected power park module owner, or their prospective owner, within three months of receiving a request, unless agreed otherwise by the HVDC system owner or DC-connected power park module owner, or their prospective owner. the time needed to break even. the societal cost per hour of such loss of supply. the costs associated with resulting changes in maintenance and operation. 1. Testing of the performance of HVDC systems and DC-connected power park modules shall aim at demonstrating that the requirements of this Regulation have been complied with. require the HVDC system owner or DC-connected power park module owner to carry out additional or alternative sets of tests in those cases where the information supplied to the relevant system operator in relation to compliance testing under the provisions of Chapter 2 of Title VI, is not sufficient to demonstrate compliance with the requirements of this Regulation. 3. The HVDC system owner or DC-connected power park module owner is responsible for carrying out the tests in accordance with the conditions laid down in Chapter 2 of Title VI. The relevant system operator shall cooperate and not unduly delay the performance of the tests. 4. The relevant system operator may participate in the compliance testing either on site or remotely from the system operator's control centre. For that purpose, the HVDC system owner or DC-connected power park module owner shall provide the monitoring equipment necessary to record all relevant test signals and measurements as well as ensure that the necessary representatives of the HVDC system owner or DC-connected power park module owner available on site for the entire testing period. Signals specified by the relevant system operator shall be provided if, for selected tests, the system operator wishes to use its own equipment to record performance. The relevant system operator has sole discretion to decide about its participation. 1. Simulation of the performance of HVDC systems and DC-connected power park modules shall aim at demonstrating that the requirements of this Regulation have been fulfilled. require the HVDC system owner or DC-connected power park module owner to carry out additional or alternative sets of simulations in those cases where the information supplied to the relevant system operator in relation to compliance simulation under the provisions of Chapter 3 of Title VI, is not sufficient to demonstrate compliance with the requirements of this Regulation. 3. To demonstrate compliance with the requirements of this Regulation, the HVDC system owner and DC-connected power park module owner shall provide a report with the simulation results. The HVDC system owner and DC-connected power park module owner shall produce and provide a validated simulation model for a given HVDC system or DC-connected power park module. The scope of the simulation models is set out in Articles 38 and 54. 4. The relevant system operator shall have the right to check that a HVDC system and DC-connected power park module complies with the requirements of this Regulation by carrying out its own compliance simulations based on the provided simulation reports, simulation models and compliance test measurements. 5. The relevant system operator shall provide the HVDC system owner or DC-connected power park module owner with technical data and a simulation model of the network, to the extent necessary to carry out the requested simulations in accordance with Chapter 3 of Title VI. 1. The HVDC system owner shall ensure that the HVDC system and HVDC converter stations are compliant with the requirements provided for by this Regulation. This compliance shall be maintained throughout the lifetime of the facility. 2. The DC-connected power park module owner shall ensure that the DC-connected power park module is compliant with the requirements under this Regulation. This compliance shall be maintained throughout the lifetime of the facility. 3. Planned modifications of the technical capabilities of the HVDC system, HVDC converter station or DC-connected power park module with possible impact on its compliance to the requirements under this Regulation shall be notified to the relevant system operator by the HVDC system owner or DC-connected power park module owner before initiating such modification. 4. Any operational incidents or failures of an HVDC system, HVDC converter station or DC-connected power park module that have impact on its compliance to the requirements of this Regulation shall be notified to the relevant system operator by the HVDC system owner or DC-connected power park module owner as soon as possible without any delay after the occurrence of such an incident. 5. Any foreseen test schedules and procedures to verify compliance of an HVDC system, HVDC converter station or DC-connected power park module with the requirements of this Regulation shall be notified to the relevant system operator by the HVDC system owner or DC-connected power park module owner in due time and prior to their launch and shall be approved by the relevant system operator. 6. The relevant system operator shall be facilitated to participate in such tests and may record the performance of the HVDC systems, HVDC converter stations or DC-connected power park modules. 1. The relevant system operator shall assess the compliance of an HVDC system, HVDC converter station and DC-connected power park module with the requirements under this Regulation throughout the lifetime of the HVDC system, HVDC converter station or DC-connected power park module. The HVDC system owner or DC-connected power park module owner shall be informed of the outcome of this assessment. 2. Where requested by the relevant system operator, the HVDC system owner or DC-connected power park module owner shall carry out compliance tests and simulations, not only during the operational notification procedures according to Title V, but repeatedly throughout the lifetime of the HVDC system, HVDC converter station or DC-connected power park module according to a plan or general scheme for repeated tests and specified simulations or after any failure, modification or replacement of any equipment that may have impact on the compliance with the requirements under this Regulation. The HVDC system owner or DC-connected power park module owner shall be informed of the outcome of these compliance tests and simulations. conditions and procedures for use of relevant equipment certificates, issued by an authorised certifier, by the DC-connected power park module owner. 4. The relevant system operator shall make publicly available the allocation of responsibilities to the HVDC system owner or DC-connected power park module owner and to the system operator for compliance testing, simulation and monitoring. 5. The relevant system operator may partially or totally assign the performance of its compliance monitoring to third parties. In this case, the relevant system operator shall ensure compliance with Article 10 by appropriate confidentiality commitments with the assignee. 6. The relevant system operator shall not unreasonably withhold any operational notification in accordance with Title V, if compliance tests or simulations cannot be performed as agreed between the relevant system operator and the HVDC system owner or DC-connected power park module owner due to reasons which are in the sole control of the relevant system operator. 7. The relevant system operator shall provide the relevant TSO when requested the compliance test and simulation results referred to in this Chapter. 1. Equipment certificates may be used instead of part of the tests below, on the condition that they are provided to the relevant system operator. Operation at active power setpoint between those minimum and maximum HVDC active power transmission capacity. 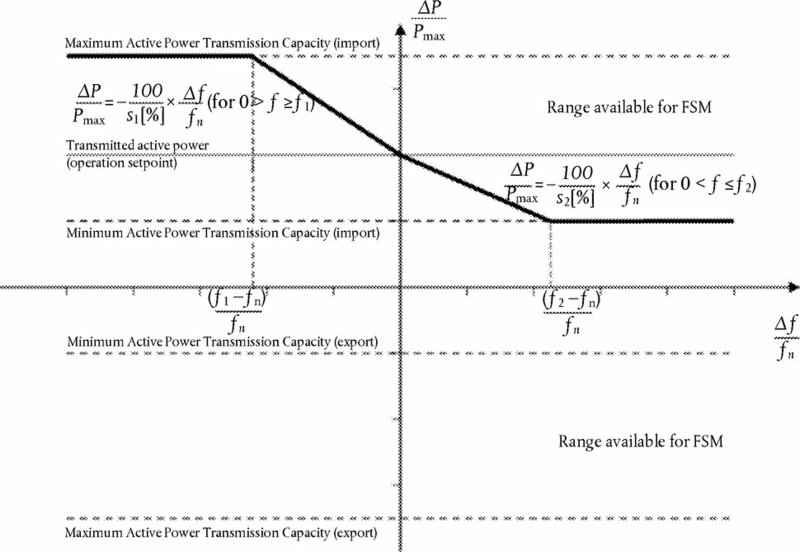 no action of any protection within the operation limits specified by reactive power capacity diagram occurs. the time of reactive power activation. following a step change in voltage, 90 % of the change in reactive power output has been achieved within the times and tolerances according to Article 22(3). the accuracy of the regulation is compliant with the conditions as referred to in Article 22(3). the response of reactive power due to step change of active power. the accuracy of the regulation is compliant with the value, as referred to in Article 22(5). insensitivity of active power frequency response at any relevant operating point does not exceed the requirements set forth in Annex II. undamped oscillations do not occur after the step change response. the dynamic response of the HVDC system when receiving instructions for the purposes of exchange or sharing of reserves, or for participating in imbalance netting processes, if capable of fulfilling the requirements for these products, as specified by the relevant TSO, has been demonstrated. the HVDC system has demonstrated stable operation during ramping periods. the HVDC system operates from a stable operating point at agreed capacity, according to the procedure of Article 37(3). operation within the range of 10-20 % of maximum capacity for 60 minutes. an active power operating point between those maximum and minimum ranges. following a step change in voltage, 90 % of the change in reactive power output has been achieved within the times and tolerances according to Article 21(3)(d) of Regulation (EU) 2016/631. the accuracy of the regulation is compliant with the conditions as referred to in Article 21(3)(d) of Regulation (EU) 2016/631. the accuracy of the regulation is compliant with the value, as referred to in Article 21(3)(d) of Regulation (EU) 2016/631. 7. With regard to the tests identified in paragraphs 4, 5 and 6 the relevant TSO may select only two of the three control options for testing. 8. With regard to LFSM-O response of DC-connected power park module, the tests shall be carried out in accordance with Article 47(3) of Regulation (EU) 2016/631. 9. With regard to LFSM-U response of DC-connected power park module, the tests shall be carried out in accordance with Article 48(3) of Regulation (EU) 2016/631. 10. With regard to active power controllability of DC-connected power park module, the tests shall be carried out in accordance with 48(2) of Regulation (EU) 2016/631. 11. With regard to FSM response of DC-connected power park module, the tests shall be carried out in accordance with Article 48(4) of Regulation (EU) 2016/631. 12. With regard to frequency restoration control of DC-connected power park module, the tests shall be carried out in accordance with Article 45(5) of Regulation (EU) 2016/631. 13. With regard to fast signal response of DC-connected power park module, the test shall be deemed passed if the DC-connected power park module can demonstrate its response within the time specified in Article 39(1)(a). 14. With regard to tests for DC-connected power park modules where the AC collection network is not at nominal 50 Hz frequency, the relevant system operator, in coordination with the relevant TSO, shall agree with the DC-connected power park module owner the compliance tests required. 1. Equipment certificates may be used instead of part of the simulations below, on the condition that they are provided to the relevant system operator. the simulation is deemed passed, provided that compliance with the requirements specified in accordance with Article 19 is demonstrated. the simulation is deemed passed, provided that compliance with the requirements specified in accordance with Article 25 is demonstrated. the simulation is deemed passed, provided that compliance with the requirements specified in accordance with Article 26 is demonstrated. compliance with the requirements as referred to in Article 20(2) to (4) is demonstrated. a change of active power transfer of the HVDC system as specified by the relevant TSO does not lead to undamped oscillations in active or reactive power of the HVDC system. the initial delay of the adjustment of the active power is shorter than the value specified in Article 13(1)(b) or reasonably justified if greater. the time of adjustment of the active power is shorter than the value specified in Article 13(1)(c) or reasonably justified if greater. 1. DC-connected power park modules are subject to the compliance simulations detailed in this Article. Equipment certificates may be used instead of part of the simulations described below, on the condition that they are provided to the relevant system operator. the simulation shall be deemed passed, provided that compliance with the requirement according to Article 20(2)(b) of Regulation (EU) 2016/631 is demonstrated. the simulation shall be deemed passed, provided that compliance with the requirement according to Article 20(3)(a) of Regulation (EU) 2016/631 is demonstrated. compliance with the requirements as referred to in Article 40(2) is demonstrated. compliance with the requirements as referred to in Article 48(2) is demonstrated. the simulation shall be deemed passed, provided that the model demonstrates compliance with the conditions of Article 21(3)(f) of Regulation (EU) 2016/631. the simulation shall be deemed passed, provided that the model demonstrates compliance with the conditions of Article 16(3)(a) of Regulation (EU) 2016/631. 1. No later than six months after the entry into force of this Regulation, the ENTSO for Electricity shall prepare and thereafter every two years provide non-binding written guidance to its members and other system operators concerning the elements of this Regulation requiring national decisions. The ENTSO for Electricity shall publish this guidance on its website. 2. ENTSO for Electricity shall consult stakeholders when providing non-binding guidance. 3. The non-binding guidance shall explain the technical issues, conditions and interdependencies which need to be considered when complying with the requirements of this Regulation at national level. assessment of whether the choice of values and ranges in the requirements applicable to HVDC systems and DC-connected power park modules under this Regulation continues to be valid. 2. The Agency, in cooperation with ENTSO for Electricity, shall produce by 12 months after the entry into force of this Regulation a list of the relevant information to be communicated by ENTSO for Electricity to the Agency in accordance with Article 8(9) and Article 9(1) of Regulation (EC) No 714/2009. The list of relevant information may be subject to updates. ENTSO for Electricity shall maintain a comprehensive, standardised format, digital data archive of the information required by the Agency. 3. Relevant TSOs shall submit to ENTSO for Electricity the information required to perform the tasks referred to in paragraphs 1 and 2. Based on a request of the regulatory authority, DSOs shall provide TSOs with information under paragraph 2 unless the information is already obtained by regulatory authorities, the Agency or ENTSO-E in relation to their respective implementation monitoring tasks, with the objective of avoiding duplication of information. 4. Where ENTSO for Electricity or the Agency establish areas subject to this Regulation where, based on market developments or experience gathered in the application of this Regulation, further harmonisation of the requirements under this Regulation is advisable to promote market integration, they shall propose draft amendments to this Regulation pursuant to Article 7(1) of Regulation (EC) No 714/2009. 1. Regulatory authorities may, at the request of a HVDC system owner or DC-connected power park module owner, or their prospective owner, relevant system operator or relevant TSO, grant HVDC system owners or DC-connected power park module owners, or their prospective owner, relevant system operators or relevant TSOs derogations from one or more provisions of this Regulation for new and existing HVDC system and/or DC-connected power park modules in accordance with Articles 78 to 82. 2. Where applicable in a Member State, derogations may be granted and revoked in accordance with Articles 78 to 81 by other authorities than the regulatory authority. 1. Each regulatory authority shall specify, after consulting relevant system operators, HVDC system owners and DC-connected power park module owners and other stakeholders whom it deems affected by this Regulation, the criteria for granting derogations pursuant to Articles 79 to 81. It shall publish those criteria on its website and notify them to the Commission within nine months of the entry into force of this Regulation. The Commission may require a regulatory authority to amend the criteria if it considers that they are not in line with this Regulation. This possibility to review and amend the criteria for granting derogations shall not affect the derogations already granted which shall continue to apply until the scheduled expiry date as detailed in the decision granting the exemption. 2. If the regulatory authority deems that it is necessary due to a change in circumstances relating to the evolution of system requirements, it may review and amend at most once every year the criteria for granting derogations in accordance with paragraph 1. Any changes to the criteria shall not apply to derogations for which a request has already been made. 3. The regulatory authority may decide that HVDC systems or DC-connected power park modules for which a request for a derogation has been filed pursuant to Articles 79 to 81 do not need to comply with the requirements of this Regulation from which a derogation has been sought from the day of filing the request until the regulatory authority's decision is issued. 1. HVDC system owners and DC-connected power park module owners, or their prospective owner, may request a derogation to one or several requirements of this Regulation. in the case of a DC-connected power park module connected to one or more remote-end HVDC converter stations, evidence that the converter station will not be affected by the derogation or, alternatively, agreement from the converter station owner to the proposed derogation. 3. Within two weeks of receipt of a request for a derogation, the relevant system operator shall confirm to the HVDC system owner or DC-connected power park module owner, or their prospective owner, whether the request is complete. If the relevant system operator considers that the request is incomplete, the HVDC system owner or DC-connected power park module owner, or their prospective owner, shall submit the additional required information within one month from the receipt of the request for additional information. If the HVDC system owner or DC-connected power park module owner, or their prospective owner, does not supply the requested information within that time limit, the request for a derogation shall be deemed withdrawn. 4. The relevant system operator shall, in coordination with the relevant TSO and any affected adjacent DSO or DSOs, assess the request for a derogation and the provided cost-benefit analysis, taking into account the criteria determined by the regulatory authority pursuant to Article 78. 5. If a request for a derogation concerns a HVDC system or DC-connected power park module connected to a distribution system, including a closed distribution system, the relevant system operator's assessment must be accompanied by an assessment of the request for a derogation by the relevant TSO. The relevant TSO shall provide its assessment within two months of being requested to do so by the relevant system operator. 6. Within six months of receipt of a request for a derogation, the relevant system operator shall forward the request to the regulatory authority and submit the assessment(s) prepared in accordance with paragraphs 4 and 5. That period may be extended by one month where the relevant system operator seeks further information from the HVDC system owner or DC-connected power park module owner, or their prospective owner, and by two months where the relevant system operator requests the relevant TSO to submit an assessment of the request for a derogation. 7. The regulatory authority shall adopt a decision concerning any request for a derogation within six months from the day after it receives the request. That time limit may be extended by three months before its expiry where the regulatory authority requires further information from the HVDC system owner or DC-connected power park module owner, or their prospective owner, or from any other interested parties. The additional period shall begin when the complete information has been received. the HVDC system owner or DC-connected power park module owner, or their prospective owner, informs the regulatory authority by means of a reasoned submission that the request for a derogation is complete. 9. The regulatory authority shall issue a reasoned decision concerning a request for a derogation. Where the regulatory authority grants a derogation, it shall specify its duration. 10. The regulatory authority shall notify its decision to the HVDC system owner or DC-connected power park module owner, or their prospective owner, the relevant system operator and the relevant TSO. 11. A regulatory authority may revoke a decision granting a derogation if the circumstances and underlying reasons no longer apply or upon a reasoned recommendation of the Commission or reasoned recommendation by the Agency pursuant to Article 83(2). 1. Relevant system operators or relevant TSOs may request a derogation for classes of HVDC systems or DC-connected power park modules connected or to be connected to their network. a cost-benefit analysis pursuant to the requirements of Article 66. If applicable, the cost-benefit analysis shall be carried out in coordination with the relevant TSO and any adjacent DSOs. 3. Where the request for a derogation is submitted by a relevant DSO or CDSO, the regulatory authority shall, within two weeks from the day after receipt of that request, ask the relevant TSO to assess the request for a derogation in the light of the criteria determined by the regulatory authority pursuant to Article 78. 4. Within two weeks from the day after the receipt of such request for assessment, the relevant TSO shall confirm to the relevant DSO or CDSO whether the request for a derogation is complete. If the relevant TSO considers that it is incomplete, the relevant DSO or CDSO shall submit the required additional information within one month from the receipt of the request for additional information. 5. Within six months of receipt of a request for a derogation, the relevant TSO shall submit to the regulatory authority its assessment, including any relevant documentation. The six-month time limit may be extended by one month where the relevant TSO seeks further information from the relevant DSO or from the relevant CDSO. 6. The regulatory authority shall adopt a decision concerning a request for a derogation within six months from the day after it receives the request. Where the request for a derogation is submitted by the relevant DSO or CDSO, the six-month time limit runs from the day following receipt of the relevant TSO's assessment pursuant to paragraph 5. 7. The six-month time limit referred to in paragraph 6 may, before its expiry, be extended by an additional three months where the regulatory authority requests further information from the relevant system operator requesting the derogation or from any other interested parties. That additional period shall run from the day following the date of receipt of the complete information. the relevant system operator informs the regulatory authority by means of a reasoned submission that the request for a derogation is complete. 8. The regulatory authority shall issue a reasoned decision concerning a request for a derogation. Where the regulatory authority grants a derogation, it shall specify its duration. 9. The regulatory authority shall notify its decision to the relevant system operator requesting the derogation, the relevant TSO and the Agency. 10. Regulatory authorities may lay down further requirements concerning the preparation of requests for derogations by relevant system operators. In doing so, regulatory authorities shall take into account the delineation between the transmission system and the distribution system at the national level and shall consult with system operators, HVDC system owners, DC-connected power park module owners and stakeholders, including manufacturers. 1. A request for a derogation to the provisions of Article 40(1)(b) and (c), Article 40(2)(a) and (b), and Articles 41 to 45 shall not be subject to Article 79(2)(d) and (e) where it relates to a DC-connected power park module that has, or will have, a single connection to a single synchronous area. 2. The regulatory authority may attach any conditions to a decision concerning request for a derogation referred to in paragraph 1. This may include a condition that the development of the connection into a multi-terminal network, or that connection of a further power park module at the same point, will cause the derogation to be evaluated by the regulatory authority or to expire. The regulatory authority shall take into account the need to optimise the configuration between the DC-connected power park module and the remote-end HVDC converter station, as well as the legitimate expectations of the DC-connected power park module owner when adopting a decision concerning a request for a derogation. 1. Regulatory authorities shall maintain a register of all derogations they have granted or refused and shall provide the Agency with an updated and consolidated register at least once every six months, a copy of which shall be given to ENTSO for Electricity. the consequences resulting from granting the derogation. 1. The Agency shall monitor the procedure of granting derogations with the cooperation of the regulatory authorities or relevant authorities of the Member State. Those authorities or relevant authorities of the Member State shall provide the Agency with all the information necessary for that purpose. 2. The Agency may issue a reasoned recommendation to a regulatory authority to revoke a derogation due to a lack of justification. The Commission may issue a reasoned recommendation to a regulatory authority or relevant authority of the Member State to revoke a derogation due to a lack of justification. 3. The Commission may request the Agency to report on the application of paragraphs 1 and 2 and to provide reasons for requesting or not requesting derogations to be revoked. 1. Regulatory authorities shall ensure that all relevant clauses in contracts and general terms and conditions relating to the grid connection of new HVDC systems or new DC-connected power park modules are brought into compliance with the requirements of this Regulation. 2. All relevant clauses in contracts and relevant clauses of general terms and conditions relating to the grid connection of existing HVDC systems or existing DC-connected power park modules subject to all or some of the requirements of this Regulation in accordance with paragraph 1 of Article 4 shall be amended in order to comply with the requirements of this Regulation. The relevant clauses shall be amended within three years following the decision of the regulatory authority or Member State as referred to in Article 4(1). 3. Regulatory authorities shall ensure that national agreements between system operators and owners of new or existing HVDC systems and DC-connected power park modules subject to this Regulation and relating to grid connection requirements for HVDC systems and DC-connected power park modules, in particular in national network codes, reflect the requirements set out in this Regulation. 1. Where an HVDC system to which the requirements of this Regulation apply is connecting synchronous areas or control areas, with at least one synchronous area or one control area not falling under the scope of application of Union legislation, the relevant TSO or, where applicable, the HVDC system owner shall endeavour to implement an agreement to ensure that the owners of HVDC systems with no legal obligation to comply with this Regulation also cooperate to fulfil the requirements. 2. If an agreement as referred to in paragraph 1 cannot be implemented, the relevant TSO or, as the case may be, the HVDC system owner concerned shall use all available means to comply with the requirements of this Regulation. Without prejudice to Article 4(2)(b) and Articles 5, 75, 76 and 78 the requirements of this Regulation shall apply from three years after publication. Done at Brussels, 26 August 2016. (2) Directive 2009/72/EC of the European Parliament and of the Council of 13 July 2009 concerning common rules for the internal market in electricity and repealing Directive 2003/54/EC (OJ L 211, 14.8.2009, p. 55). (3) Commission Regulation (EU) 2015/1222 of 24 July 2015 establishing a guideline on capacity allocation and congestion management (OJ L 197, 25.7.2015, p. 24). (5) Commission Regulation (EU) 2016/631 of 14 April 2016 establishing a network code on requirements for grid connection of generators (OJ L 112, 27.4.2016, p. 1). (6) Commission Regulation (EU) 2016/1388 of 17 August 2016 establishing a Network Code on Demand Connection (OJ L 223, 18.8.2016, p. 10). Table 1: Minimum time periods an HVDC system shall be able to operate for different frequencies deviating from a nominal value without disconnecting from the network. Figure 1: Active power frequency response capability of an HVDC system in FSM illustrating the case of zero deadband and insensitivity with a positive active power setpoint (import mode). ΔΡ is the change in active power output from the HVDC system. fn is the target frequency in the AC network where the FSM service is provided and Δf is the frequency deviation in the AC network where the FSM service is provided. if the initial delay of activation is greater than 0,5 second, the HVDC system owner shall reasonably justify it to the relevant TSO. 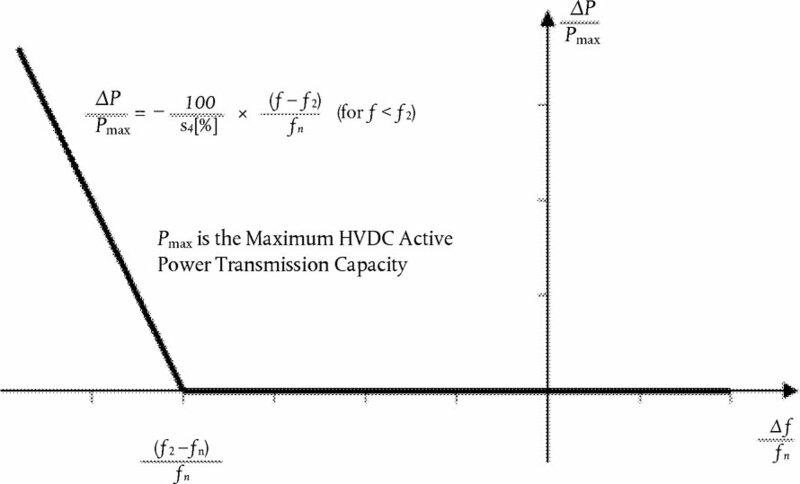 Figure 2: Active power frequency response capability of an HVDC system. 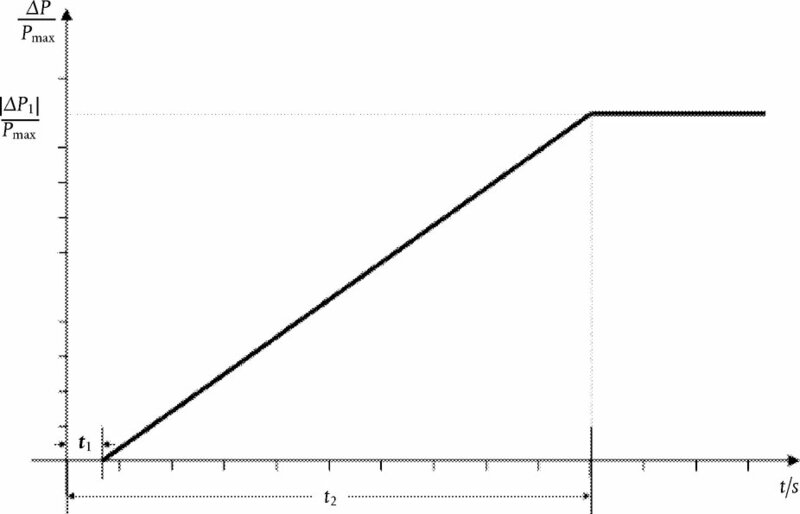 ΔΡ is the change in active power triggered by the step change in frequency. Table 3: Parameters for full activation of active power frequency response resulting from frequency step change. as long as a frequency deviation continues active power control shall not have any adverse impact on the active power frequency response. the HVDC system shall be capable of stable operation during LFSM-O operation. When LFSM-O is active, hierarchy of control functions shall be organised in accordance with Article 35. The frequency threshold and droop settings referred to in point (a) of paragraph 1 shall be determined by the relevant TSO and be notified to the regulatory authority in accordance with the applicable national regulatory framework. Figure 3: Active power frequency response capability of HVDC systems in LFSM-O. ΔΡ is the change in active power output from the HVDC system and, depending on the operational conditions, either a decrease of import power or an increase of export power. f n is the nominal frequency of the AC network or networks the HVDC system is connected to and Δf is the frequency change in the AC network or networks the HVDC is connected to. At overfrequencies where f is above f 1 the HVDC system shall reduce active power according to the droop setting. the HVDC system shall be capable of stable operation during LFSM-U operation. When LFSM-U is active, hierarchy of control functions shall be organised in accordance with Article 35. Figure 4: Active power frequency response capability of HVDC systems in LFSM-U. ΔΡ is the change in active power output from the HVDC system, depending on the operation condition a decrease of import power or an increase of export power. fn is the nominal frequency in the AC network or networks the HVDC system is connected and Δf is the frequency change in the AC network or networks the HVDC is connected. At underfrequencies where f is below f2, the HVDC system has to increase active power output according to the droop s4 . Table 4: Minimum time periods an HVDC system shall be capable of operating for voltages deviating from the reference 1 pu value at the connection points without disconnecting from the network. This table applies in case of pu voltage base values at or above 110 kV and up to (not including) 300 kV. Table 5: Minimum time periods an HVDC system shall be capable of operating for voltages deviating from the reference 1 pu value at the connection points without disconnecting from the network. This table applies in case of pu voltage base values from 300 kV to 400 kV (included). Figure 5: The diagram represents boundaries of a U-Q/Pmax-profile with U being the voltage at the connection points expressed by the ratio of its actual value to its reference 1 pu value in per unit, and Q/Pmax the ratio of the reactive power to the maximum HVDC active power transmission capacity. The position, size and shape of the inner envelope are indicative and shapes other than rectangular may be used within the inner envelope. For profile shapes other than rectangular, the voltage range represents the highest and lowest voltage points in this shape. Such a profile would not give rise to the full reactive power range being available across the range of steady-state voltages. Table 6: Parameters for the Inner Envelope in the Figure. Figure 6: Fault-ride-through profile of an HVDC converter station. 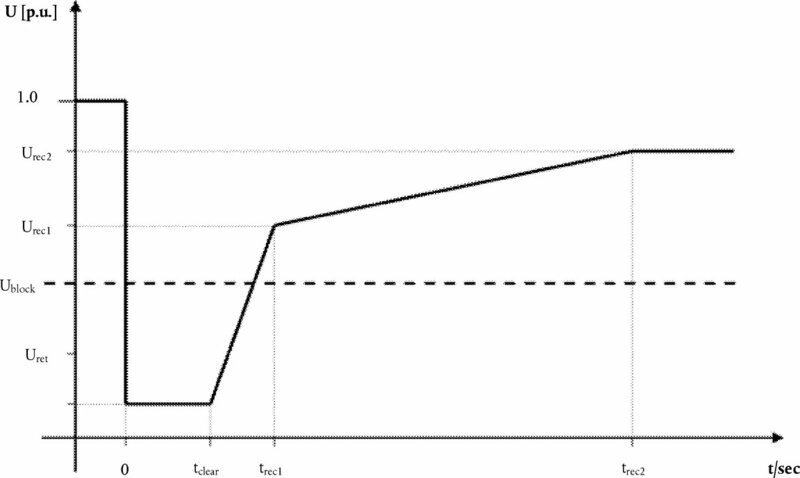 The diagram represents the lower limit of a voltage-against-time profile at the connection point, expressed by the ratio of its actual value and its reference 1 pu value in per unit before, during and after a fault. Uret is the retained voltage at the connection point during a fault, tclear is the instant when the fault has been cleared, Urec1 and trec1 specify a point of lower limits of voltage recovery following fault clearance. Ublock is the blocking voltage at the connection point. The time values referred to are measured from tfault. 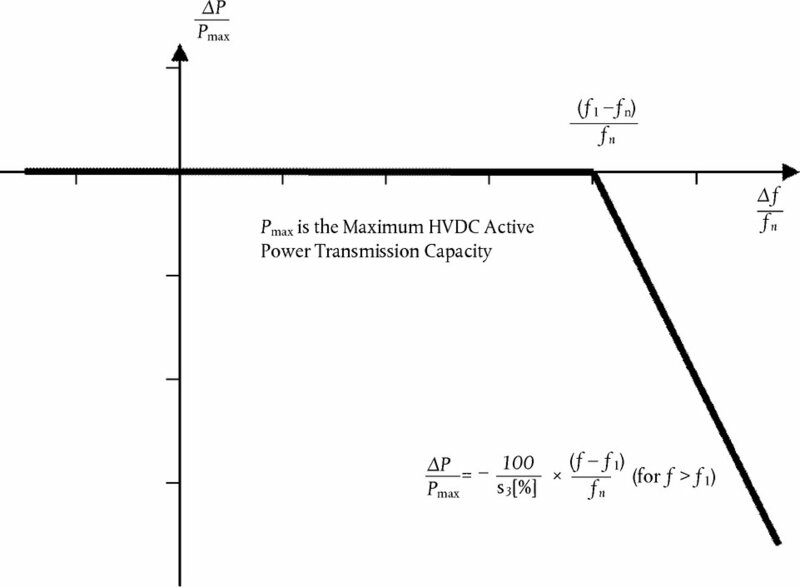 Table 7: Parameters for Figure 6 for the fault-ride-through capability of an HVDC converter station. Table 8: Minimum time periods for the 50 Hz nominal system for which a PPM shall be capable of operating for different frequencies deviating from a nominal value without disconnecting from the network. Unlimited, unless specified otherwise by the relevant system operator, in coordination with the relevant TSO. To be specified by the relevant system operator, in coordination with the relevant TSO. Table 9: Minimum time periods for which a DC-connected power park module shall be capable of operating for different voltages deviating from a reference 1 pu value without disconnecting from the network where the voltage base for pu values is from 110 kV to (not including) 300 kV. To be specified by the relevant system operator, in coordination with the relevant TSO. Various sub-ranges of voltage withstand capability can be specified. Table 10: Minimum time periods for which a DC-connected power park module shall be capable of operating for different voltages deviating from a reference 1 pu value without disconnecting from the network where the voltage base for pu values is from 300 kV to 400 kV (included). Figure 7: U-Q/Pmax-profile of a DC-connected power park module at the connection point. 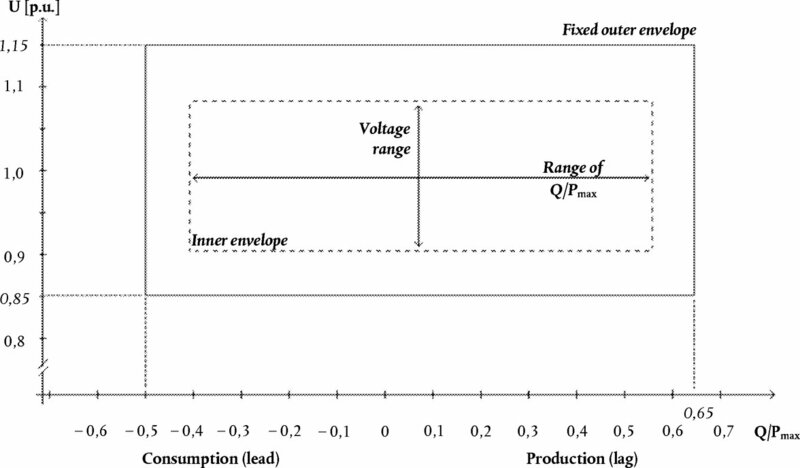 The diagram represents boundaries of a U-Q/Pmax-profile of the voltage at the connection point[s], expressed by the ratio of its actual value to its reference 1 pu value in per unit, against the ratio of the reactive power (Q) to the maximum capacity (Pmax). The position, size and shape of the inner envelope are indicative and other than rectangular may be used within the inner envelope. For profile shapes other than rectangular, the voltage range represents the highest and lowest voltage points. Such a profile would not give rise to the full reactive power range being available across the range of steady-state voltages. Table 12: Minimum time periods for which a remote-end HVDC converter station shall be capable of operating for different voltages deviating from a reference 1 pu value without disconnecting from the network where the voltage base for pu values is from 110 kV to (not including) 300 kV. To be specified by the relevant system operator, in coordination with the relevant TSO. Various sub-ranges of voltage withstand capability may be specified. Table 13: Minimum time periods for which a remote-end HVDC converter station shall be capable of operating for different voltages deviating from a reference 1 pu value without disconnecting from the network where the voltage base for pu values is from 300 kV to 400 kV (included). Table 14: Maximum range of both Q/Pmax and steady-state voltage for a remote-end HVDC converter station.